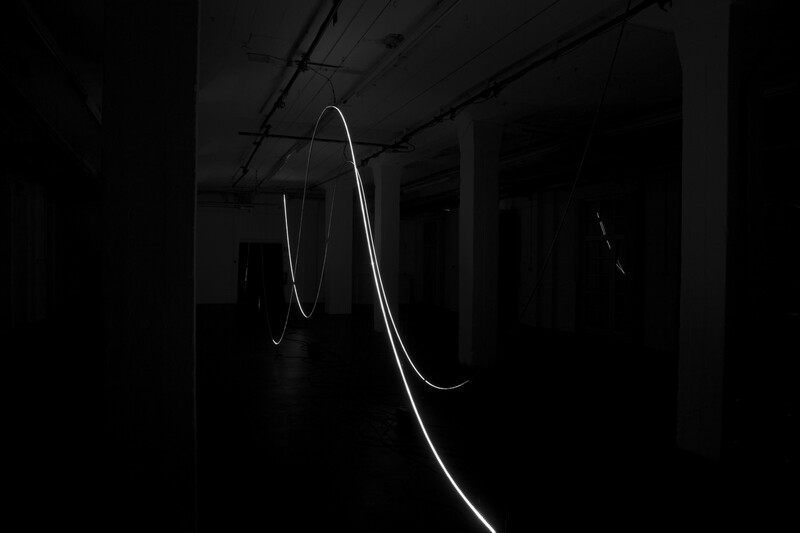 the weight of light is a project where light receives gravity. Light, as we usually interpret it, is an element without mass and gravity. For the weight of light forces are mapped to moving light particles responding to the physics we know from reality. Through the use of Newton’s laws of motion a fictional space is created. For the weight of light forces are mapped to moving light particles responding to the physics we know from reality. Through the use of Newton’s laws of motion a fictional space is created. For the weight of light a physics engine simulates the kinetic forces of a moving object. This mass is projected on a wave shaped structure in virtual space. The moving object is represented as a light particle in physical space. Gravity, mass, density and friction affect velocity and acceleration of these light particles. As the particles movement is based on a simulation, it does not have to adhere to the physical realities we know from everyday life. Therefore weight of light is able to go beyond expected behaviour. Thus the matter of light traverses a reinterpretation of our known reality. Each moving light particle is underlined by an auditive representation in the range of low frequencies. Phenomena of standing sound waves and frequency interferences support the shape waved structure. Thereby an immersive space is created where the movement of light is also represented by vibrational patterns of oscillating sound waves. the weight of light plays with our sense of reality by continually causing us to perceive and experience a fictional space of light, gravity and sound. weight of light emphasizes the materiality of immaterial elements in an revolving reality which overcomes the dualism of “virtual” and “real”. How much does light weight? The sort of question a child would ask, you might think? Martin Hesselmeier and Andreas Muxel came upon it somewhere on the Net - and it was the inspiration for their piece "the weight of light". 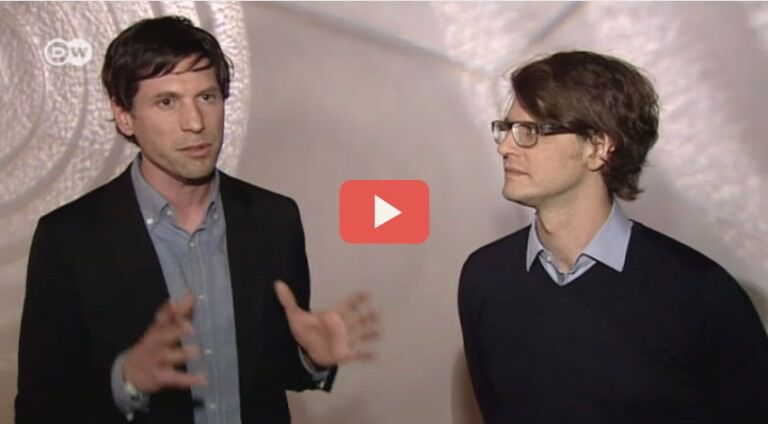 Such a stimulus always sets a process in motion, the Austria-German artist duo says. Sketches, models, transformation, experiments. In the studio, at the computer, and on site. The hunt is on, and the two artists-engineers-scientists look for the poetry of material, for the weight of light. And indeed: they render it visible. 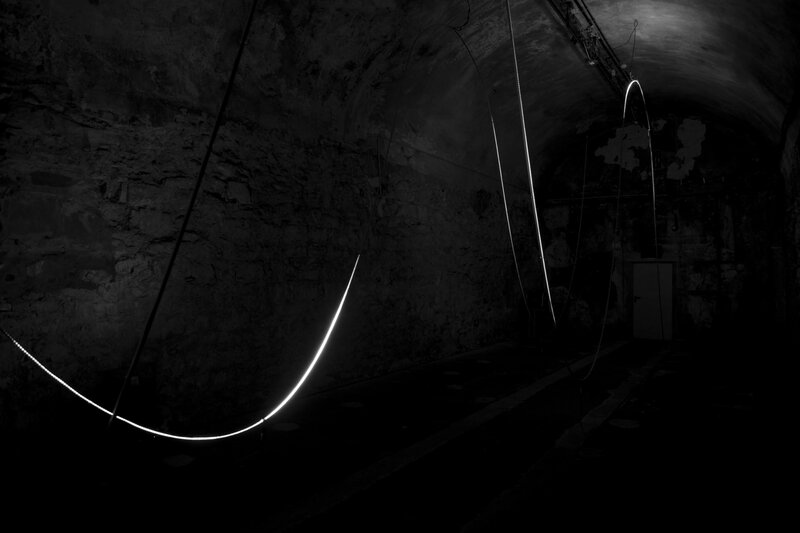 In their installation in the storage cellars of the former Lindenbrauerei brewery, dots of light go racing from their starting point higher up along stripes that are several yards long, brake slightly when the track moves upward, only to pick up speed again on the downward path. Quite evidently, these dots of light obey gravity, in fact they appear to have a mass, momentum and kinetic energy. These are not some stupidly blinking LEDs, but fascinatingly fast little balls of light. Like gods, Hesselmeier & Muxel have lent light weight. 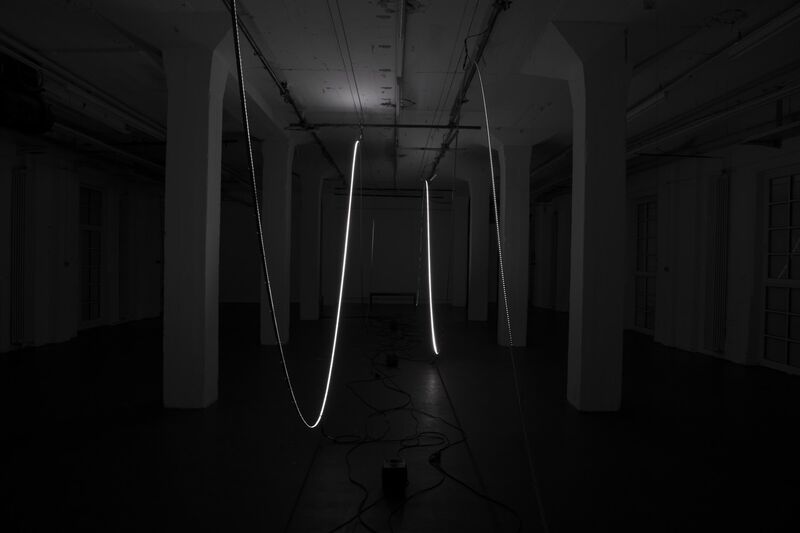 In this way, light art morphs into kinetic art. 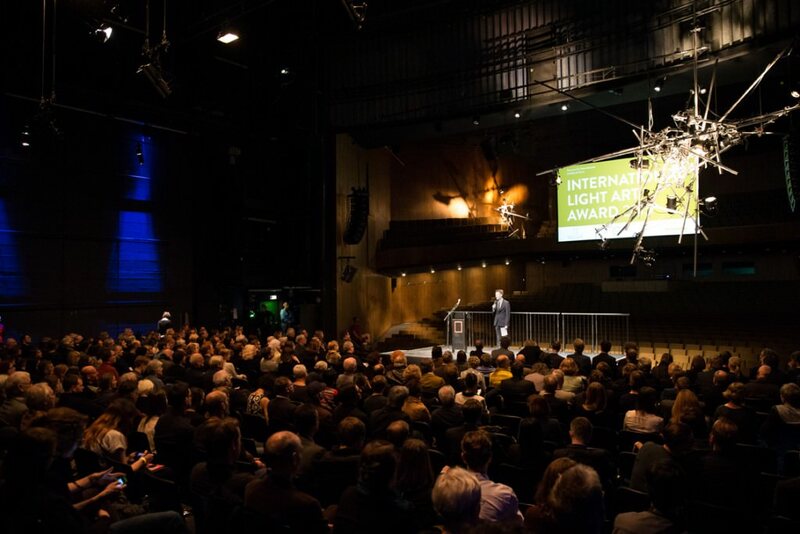 These are properties that also characterized capacitive body, the interactive kinetic sculpture that was first experienced in 2008 in Groningen and then traveled in a modified form to countless festivals - a mixture of media art and sound. capacitive body consisted of a glass pavilion full of bright strings of light. The glass walls served both as a membrane that absorbed ambient movements, vibrations triggered by cars or passers by, and translated these into appropriate light rhythms. Piezoelectronic sensors, electroluminescent strings of light, and a microcontroller teamed up to transpose reality into a light space that represented nothing other than a beautiful nervous system. "the weight of light" goes one step further in conceptual terms: following the playful transformation of light into a kind of body with physical properties, the two artists have now incorporated a further, more dialectical level of perception into their work. The software which was previously used to ensure the perfect simulation of a realistic setting is now allowed to have a life of its own. Thanks to a random generator, the parameters change such that the light is suddenly subject to new laws of gravity, with quite literally supernatural liberties coming into play. Not that the experiment ever gets out of control - the artists simply let it get out of hand in a controlled way. An artistic strategy that has a long lineage stretching back into the 20th century. The trick here is that it is applied to what is already a precarious relationship between reality and simulation, material properties and light, the digital and the electrified. 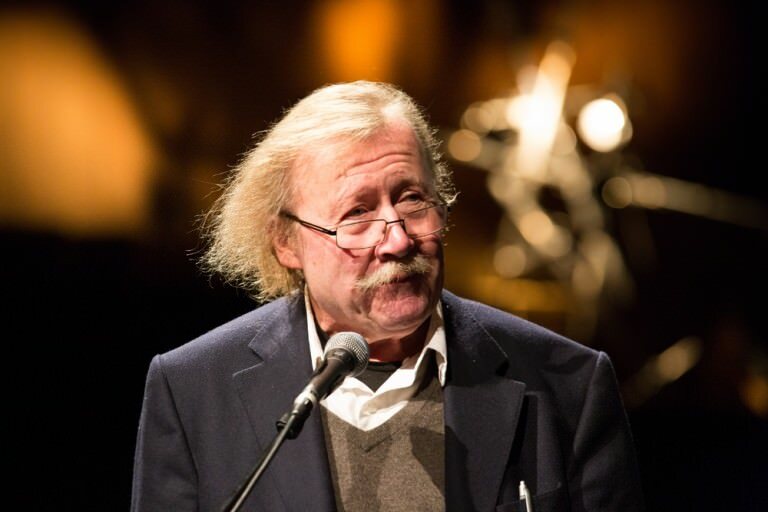 Hesselmeier & Muxel do not abandon their autonomy the way the first computer artists said was necessary, back in the 1960s. Instead, they tend to think in romantic categories: beauty, they insist, will spawn knowledge. The piece also has a pronounced sound aesthetic, too, and the space in question is thus "modulated" in all respects. "We've come up with a specific mode for our work," comments Andreas Muxel. The two artists are based in a studio in Cologne's Deutz district, and their collaboration on specific projects is always a product of their joint interests. They are both fascinated by the machine art of the 1920s and 1930s, the computer experiments of the 1960s, not to mention the high-tech poetry of installation artists today. The art they find most compelling is that which makes no bones about the path from idea to experiment. Technology provides the stimulus. But in the final instance, what counts is the beauty innate in the appliances.